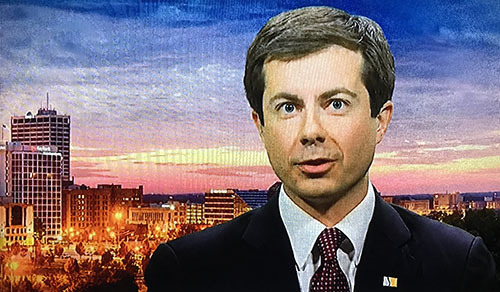 SOUTH BEND - Mayor Pete Buttigieg joins the Hoosier presidential candidate ranks today that has included the Harrisons, Eugene Debs, Wendell Willkie, Birch and Evan Bayh, Vance Hartke, Richard Lugar, Dan Quayle and Richard Lugar. He'll kick off his campaign at 2 p.m. today inside Studebaker Building 84, with the campaign expecting 10,000 people. Buttigieg said Friday, "What we've seen as we've explored is that we're exploring some really beautiful territory and now it's time to make it official and announce a campaign. We've been talked about in the 2020 context in a pretty big way for going on a month now. The rain location may be a blessing in disguise because there is such symbolic power in that building and you can see in it the past, the present and the future." Beyond President William Henry Harrison (1840) and grandson Benjamin (1888), these campaigns have been mostly vanity excursions. Sen. Birch Bayh was an early frontrunner in 1976 until he was eclipsed by Georgia Gov. Jimmy Carter in Iowa and New Hampshire. Evan Bayh and Dan Quayle quickly folded their campaigns as Barack Obama and George W. Bush consolidated early nominations. Buttigieg has risen to third in polls in Iowa and New Hampshire, which rates him either "flavor of the month" status or, perhaps, the next prodigy. If elected at age 39, he would be the youngest president ever and the first mayor to jump directly from city hall to the White House. The mayor, who trails septuagenarian front runners Joe Biden and Bernie Sanders will also echo President John F. Kennedy, who in 1960 called for the "torch to pass to a new generation."